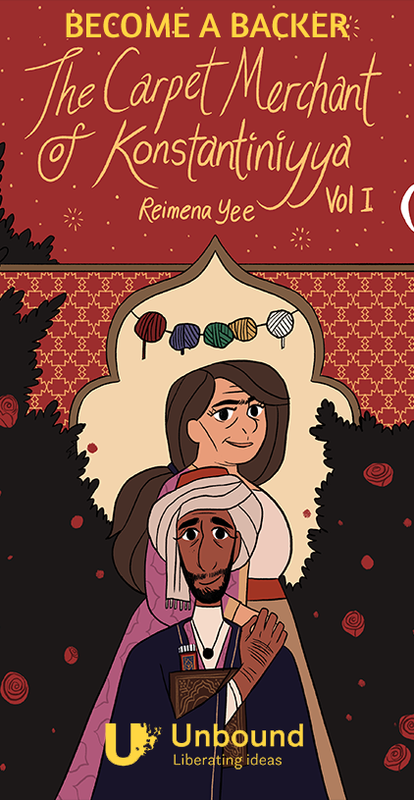 This is the official site to read The Carpet Merchant of Konstantiniyya by Reimena Yee! The other official site is the press page on my portfolio website, where you can get a summary, preview pages, press, etc. The Carpet Merchant is divided into two volumes, each comprising of two books/chapters worth 300 pages. A hardcover copy of Vol I is currently being crowdfunded via Unbound, a Penguin Random House imprint. CLICK HERE TO BECOME A BACKER. Here’s the playlist I curated for when I was writing/drawing The Carpet Merchant. It’s mostly instrumental, and the music follows the narrative, kinda like a soundtrack! This was a very beautiful story mashallah. As a Muslim myself it was so wonderful to see Zeynel’s steadfastness throughout the story. I love that you chose to depict his faith in such an inspirational and moving manner. By the end of the story I was in tears. Reading the English translations of Quranic verses and duas being said by Zeynel as frequently as I myself say them was so lovely as I could identify with him during his testing moments and feel uplifted when his faith in Allah helped him through his struggles. This story also had me rooting for Claudius (Mora) which I enjoyed by having my perception of him change from despising him, and when Zeynel prayed the dua upon his death I felt an overwhelming sense of compassion and love for Claudius and I too wished he would be forgiven. Thank you for bringing to life an incredible story full of laughter and happiness and love and tears and sadness and anger and frustration and much more! I have definitely become attached to this story as it in a way renewed my own Islamic beliefs and I feel much more closer to Allah, learning from this story that no matter the struggles I face in life and the hardship I may bear, truly it is Allah alone I should turn to, and I should trust Allah with my fate. Mashallah once again thank you for this, may you continue to flourish and bring as much joy to others as you have done to me inshallah!! I’m sorry for only commenting on the very last picture. After seeing excerpts from your webcomic appear every now and then on my feed, I finally found the time to actually start, binge-read, and finish the whole story in a few hours (only pausing about a third-way in to back the book on Unbound before digging right back in). I fell in love with it. It’s a beautiful love story to faith, arts, beauty, love itself, and countries and cultures I short of knew nothing about. It makes me want to work harder on myself. You deserve all the recognition you can get, and I hope you’ll get more of it along the way.